Located in the mountains of Western North Carolina, this secluded, 39-acre resort on Stecoah Creek is surrounded by the beauty of the Great Smoky Mountains. The area has some of the best motorcycle riding in the world. 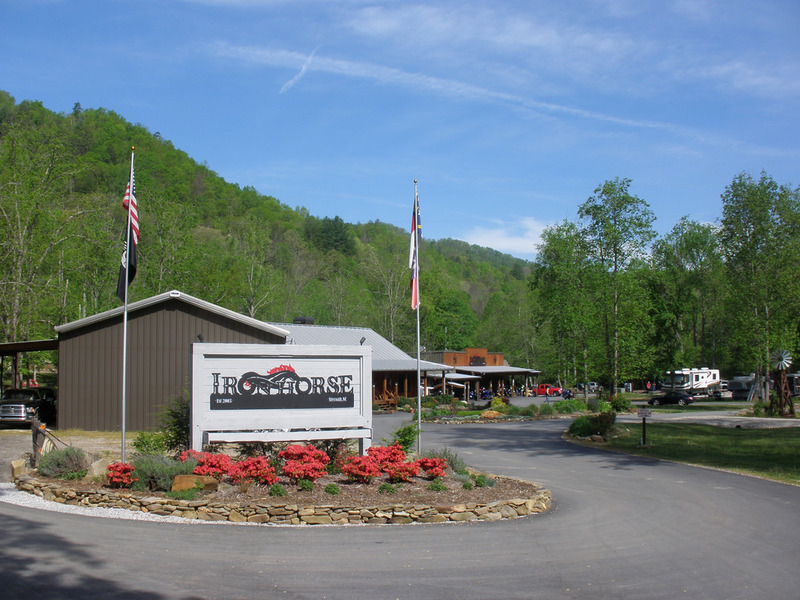 Iron Horse Motorcycle Lodge is within minutes of the famous Tail of the Dragon at Deals Gap, the scenic Cherohala Skyway, Moonshiner 28, Blue Ridge Parkway, Cherokee , Fontana Dam, and the Nantahala River Gorge. Whether you are on a cruiser, sport bike or dual sport, Iron Horse is where riders stay and play. Established 2003 ~ For Riders By Riders/Owners John and Charlene Powell decided that motorcycle riders needed a resort destination of their own. Wanting to bridge the free spirit of the old west with the free spirit of the modern motorcyclists, we designed the Iron Horse with a western flair. We planned to offer a wide range of accommodations and facilities. After a hearty home cooked meal join us around the creek side fire pit. Meet new friends or reunite with old friends and share stories of your rides. Rock your cares away in one of our rocking chairs on the deck overlooking the creek. Looking for great riding and a place to relax and kick back with fellow riders? Iron Horse Motorcycle Lodge & Resort is your destination. Make your reservations today and join the many other riders who come to our resort every year.